BAR have reacted angrily after being banned for two races for running an underweight car at the San Marino GP. The sanction, which included a six month ban suspended for a year, was the toughest in F1 for 20 years. "BAR Honda is appalled at the decision and asserts that the judgment is contrary to all of the evidence heard. "The team proved it complied with the current regulations and the FIA now acknowledges that the regulations are unclear," said BAR team boss Nick Fry. "While the International Court of Appeal rejected the FIA's original accusations of fraud and deception, BAR Honda says that this penalty is wholly and grossly disproportionate." The team have been excluded from the Spanish and Monaco Grands Prix, and stripped of the 10 points Jenson Button and Takuma Sato picked up for finishing third and fifth at Imola. BAR initially considered legal action to try and overturn the ban but later annouced they would accept the punishment. F1 supremo Bernie Ecclestone said he felt BAR were lucky not to have been excluded for longer and warned Fry he would have been unwise to sue. "I thought it was a very fair thing to do to be honest. I feel they got off quite lightly." 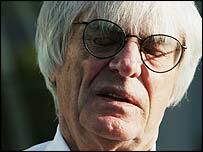 Ecclestone added: "Other people might think they admitted they infringed the regulations. Anyone else is going to say they were warned at the start of the championship, they decided to ignore it. World governing body the FIA had asked for the team to be kicked out of the Formula One for the rest of the season for deliberately running an underweight car at Imola to give Button an advantage. But their appeal court rejected accusations of cheating, ruling there was insufficient evidence to prove BAR "deliberately committed fraud". FIA president Max Mosley said the punishment could have been harsher. "The facts are very clear. The team was asked to pump the fuel out of their car [after the race]. "They left 15 litres in the tank and told us it was empty. Under the circumstances, we feel they have been treated rather leniently." Toyota technical director Mike Gascoyne agreed with Mosley. "I think they are quite lucky to get away with that, in my opinion," he said. Ecclestone: "BAR got off lightly"
McLaren driver Juan Pablo Montoya and championship leader Fernando Alonso both expressed sympathy for Button and Sato. "I was shocked actually that they put them out of the races but that's the way it goes I guess," said Montoya. Alonso added: "We all agree that there are specific rules for all the teams. "If you are not inside the rules then you risk having a penalty. "I think Jenson did a fantastic race in Imola and he was on the podium because he deserved that podium in the way he drove. You are risking a lot in the whole race. "When it's not your fault and you are out it will be a disappointment but I'm sure they will come back." The last team to be banned was Tyrrell, which missed the last three races in 1984. The team was banned because the sport's governing body ruled that a performance aide was found in the water that was sprayed over Martin Brundle's engine air intake valves at the Detroit Grand Prix.